NS bases its policy priorities on material relevance, weighing up the interests of stakeholders and the actual impact that NS can have on the topic. Once every two years, NS arranges centralised dialogues with all categories of stakeholders about our social role and the themes that they find important and that our organisation has an impact on: the materially relevant themes. Based on the centralised dialogues, we draw up the material relevance matrix. 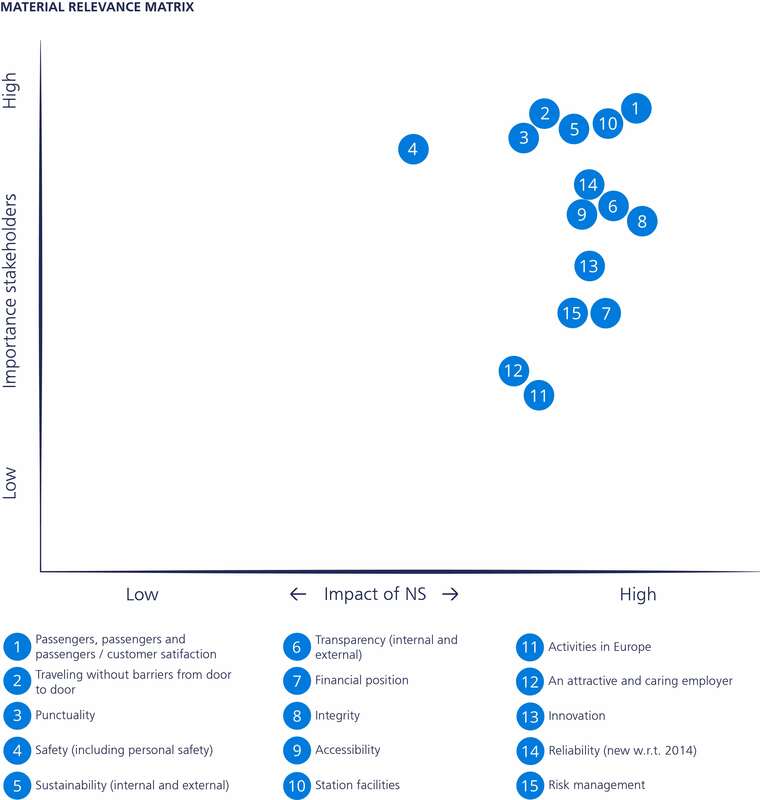 The material relevance matrix lets you see which themes our key stakeholders deem most important, what priorities they assign to them and what impact NS has. NS assessed the materially relevant themes for 2016 to check that they were up to date and valid when compared with 2015, which was when the last stakeholder dialogue took place. This is how we made sure our stakeholders’ expectations and interests were taken into account in the process of determining the materially relevant themes. Compared with the previous year, there were no changes at all in the materially relevant themes. This picture was confirmed in additional checks: continuous monitoring, media and Internet analysis and regular meetings with stakeholders. Furthermore, internal sector experts looked at developments within the public transport sector. The matrix for 2016 was then presented to the Executive Board and finalised. The most materially relevant themes are: (1) customer satisfaction (Passengers, passengers and passengers); (2) no barriers to door-to-door journeys; (3) punctuality. Personal safety (4), sustainability (5) and facilities at stations (10) also score high. Two materially relevant themes have been given more weight and a different content. The first is NS as an employer: more attention is being paid by the outside world to certain issues relating to employee participation or the tasks of NS staff. Topics such as double staffing on trains, the implementation of measures dealing with personal safety and dissatisfaction among some staff about the lack of variety in work packages received considerable media attention in 2016. The second theme that has been amended is sustainability. There is a demand among NGOs (including MVO Nederland, De Groene Zaak, the Confederation of Netherlands Industry and Employers VNO-NCW and the Netherlands Environmental Assessment Agency) and a need from the point of view of transparency for more explicit reports on the contribution NS makes to the UN Sustainable Development Goals (SDGs). In view of the materially relevant theme of sustainability, NS already reports on indicators relating to energy efficiency, waste reduction and the reduction of CO2 emissions. They can be found as the contributions to SDG 7 (affordable and clean energy), 11 (sustainable cities and communities) and 13 (climate action) respectively. In the vision on mobility drawn up by NS and urban transport organisations and in the Mobility Alliance with a wide range of transport players, a view was presented on how to make the Netherlands sustainable, accessible and pleasant to live in, which also contributes to SDG 11. The content of this report is partly determined by the outcomes from the analysis of material relevance; as such, it meets the information needs of stakeholders.